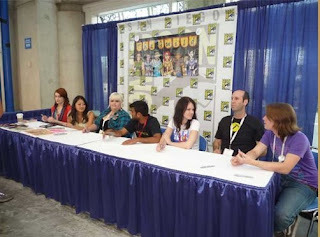 the last geek bus home: Knights of The Guild at Comic-Con: The Panel, Booth and More! Knights of The Guild at Comic-Con: The Panel, Booth and More! Want to hear the inside story of The Guild at Comic-Con? Do you want to watch "Do You Want To Date My Avatar?"? And Omnibus 8 (Chapters 36-40) of my novel "Turning Left at Albuquerque" is now up on turningleft.podbean.com. Each omnibus is about 21 mins long and follows the fortunes of Jason, a geek in crisis since losing his job. We've had some great feedback so if you listen and have something to share - let's have it!